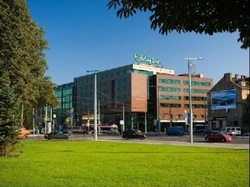 The Novotel Vilnius, a hotel in the historic and commercial heart of Vilnius. 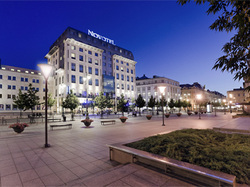 Novotel Vilnius on the so called Champs Elysees of Vilnius is perfect for exploring the romantic streets of Vilnius Old Town. After a busy day enjoy the bar or relax in the hotel gym and sauna. Free WiFi. 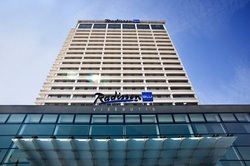 The high-rise Radisson Blu has been one of Vilnius’ defining landmarks for decades. The bar on the top floor is one of the city’s legendary drinkers (see our Top of Town tour package). The rooms themselves are as luxurious as you would expect, boasting some splendid views. Be safe assured that you will always get high quality and service! Free WiFi. This hotel provides everything one would expect from one of the world's best known quality hotel brands. A fine in-house steak restaurant and a bar with big people-watching windows. The centre can be reached on foot in a matter of minutes. A great hotel - always offering the best quality and service! Free WiFi.